I'm sure it surprises nobody that I read a lot. I would justify it to y'all but then I was thinking you know what, I enjoy it and it makes my heart+soul sparkly so I don't feel it needs justifying. Not that reading is a bad thing. Anyway, Winter is peak reading time. The temperatures drop and I stay indoors. Electric blanket on, pages to turn and mull over. Yes please. 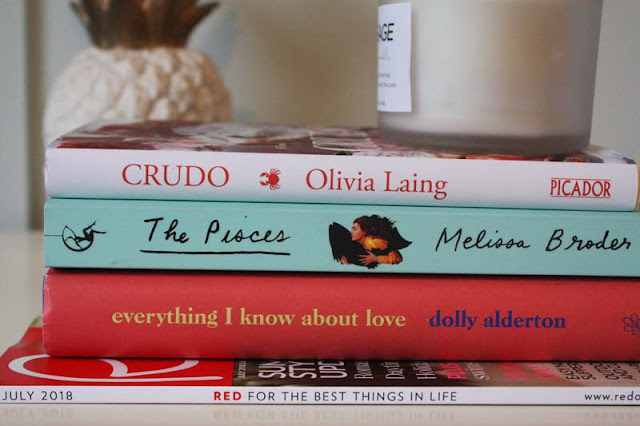 Today we have a little list of some of the books I've been reading during Winter. There's a heap of fiction which is unusual for me, the memoir+essay loving person that I am. On a more pleasing note, everything is written by women. #whoruntheworld am I right ladies? fates and furies x lauren groff: What a book. An utterly rewarding novel although it did take me a while to get into it. The story of the marriage between Lotto and Mathilde who meet as struggling creatives and live a life that is rich and flawed and full. Fates and Furies is split into two; fates being the story of Lotto and Furies Mathilde's. I will admit Fates did drag a little bit for me and I found Furies a lot more satisfying. That could just be because I left it too long between readings. I did really enjoy it though and have passed it along to one of my friends to read next. ponti x sharlene teo: This was the Lit Reads title for July. Lit Reads being Time Out's book club here in Auckland. Admittedly this is not a novel I'd usually reach for but the fact it is a story of three young women, across three different time periods and all intertwining really appealed to me. Three young women coming of age in Singapore. Teo really captures all the intricacies of young adulthood and that feverish heat+tropical environment so vividly. Yes I found some of her descriptions a bit much...ahem, tapeworm but that's really the only thing I didn't like about this. All three women are flawed and unlikeable which I love. You don't hate them per se but the fact they are more real and nuanced makes these stories that much more appealing. things i don't want to know x deborah levy: The first book in Levy's trilogy of autobiographical writings. This one focuses on her childhood and adolescence across South Africa and then England. The title, drawing from the idea that what we don't want to know is what we cannot write down. We can't see it in ink because it's too painful. Too permanent. A concept I could really relate to and I feel like anybody who writes or keeps a journal will find it resonates as well. You don't need to read Levy's volumes in order. The two published stand alone but I highly recommend you get ahold of them both. bluets x maggie nelson: A reread for me, inspired by Ella and Durga's discussion of colour at the Writers Festival, more on that here. A wonderful, brilliant, passionate consideration of blue as a colour, a feeling and an overarching idea. In it Nelson writes on everything from the way she curates blue objects, to the feelings around Joni Mitchell's Blue album (well worth a listen, one of my all time favourites), how we associate colour with feelings without being explicit about it among other things. I underlined and scribbled notes all through Bluets this time. Freakin' love everything about this book. crudo x olivia laing: I am currently reading this alongside The Lonely City, also by Laing. 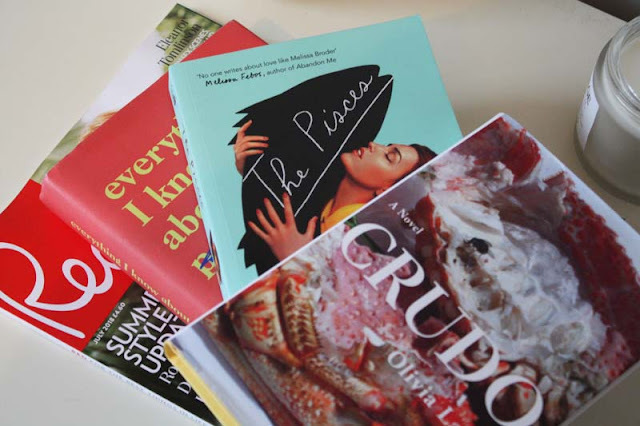 Crudo is her first novel and it is semi-autobiographical yet it centres around Kathy Acker as the protagonist. For those unfamiliar, Kathy Acker was an American writer. Written over seven weeks, I believe, Laing ruminates on the world as she knew it in 2017 and the way in which our collective lives are shaped now. Subsequently it hits close to home in many regards and I find myself reading it in bursts as a result but it is by no means a downer of a book. If that makes sense. Side note: I love the grotesque beauty of this cover. Too good. the pisces x melissa broder: Ah this book. The book I 100% do not recommend you bring to an office of non-readers. "Is this like Fifty Shades!? Sophie, what are you reading?!" Lesson learnt. This novel is quite the read; mermen, mental health and a lot of romance. It's an addicting read. A NSFW read but an addicting read no less.